new season, new blog feature. starting this month, i will be doing a regular stylehacker series that will feature stylish + functional tips and cool alternatives to those splurgey wishlist items that are always tempting you to spend more than you should. what do you think? let me know if you get one, or anything else from the sale! This is a great idea for a blog feature. 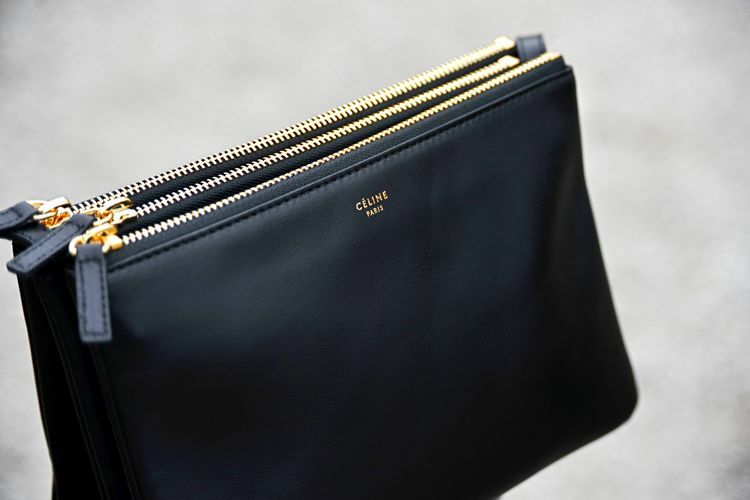 The bag that you featured is a great alternative to the Celine and beautiful in its own right. It's perfect for travel, I think. thansk lindsay :) i almost did a little dance when i found this bag - it's discreetly luxe and really perfect as a little all-day/night crossbody for traveling! What a great find! It looks really nice but there's always something drawing me back to the original. nice find! must've been hard to find a proper alternative. I like this new feature - always good to know about alternatives especially for the trio, of which this is a heavy contender. Wish that they were lined though - probably would have ended up with one! I was a little naughty and purchased a white tank and a simple bracelet.. the former having been on my wishlist for yonks though! It's lovely... I've been eyeing it on Shopbop for a while now, but as Aissa said, something always draws me back to the Trio. This one is nice that it's distinct enough not to come off as being too "inspired" but the Trio though. I'm kind of hoping that Baggu will make their drawstring pouch in Burgundy. Or perhaps I'll find something in Turkey when I'm there.. Such a fun feature and can't wait to see what's next! The leather looks luxurious and the price point is good. Can't wait to read a review about it. Oof, I had to shut down during the sale because I wanted too many things. The bag is cute, hope you review it! I'm still on the lookout for a small crossbody and definitely will be making a decision before the warm weather really hits. I'd been longing for the Celine Trio for a while. Knowing it would never be a purchase I could justify, I was glad to come across your post about the Annabel Ingall bag, a truly great alternative. I saved a bit and purchased one, in a gorgeous muted green color, and find it's the perfect-sized bag for me, completing my collection of having three lush, leather purses (one big, one medium, one small) in great non-black neutral tones. Even with all the pockets filled, it's not bulky and it keeps me organized. Hi! I'm a long time reader, first time commenter, and totally in love with your simple, sophisticated take on dressing. Anyway, I stumbled across another alternative to the Celine Trio that was just too good to keep to myself! At just over $100.00, it's a great budget alternative that still packs much of the flavor of the original.